Leading women and Layers of London by Karina Flynn, Volunteer co-ordinator. This year marks the 150th anniversary of women being admitted to the University of London, the first time in Britain that women had gained access to university education. Throughout 2018 the University is celebrating this with a range of events and activities, through their Leading Women campaign. Inspired by this anniversary we began to think about and discuss notable women in London’s history, and the importance of sharing these histories through Layers of London – connecting people with places, and uncovering lesser told stories significant to individual areas. Having recently begun my role on the project as Volunteer Coordinator I met with a volunteer, Margaret Chan, based in Croydon who has been publishing her own research, based on local knowledge and family history, through Layers of London. Margaret shared with us a short piece about a significant woman in the history of her locality. This research tells us not only about a particular area of South London, but provides a broader social history enabling us to better understand people and society during this time and we thank Margaret for enabling us to share her fascinating research. From at least the 17th century to the mid-19th century, Romany people (called gypsies in contemporary accounts) camped in Norwood, Penge and Croydon Common, particularly in the summer months. The former Romany presence in this part of South London is still marked in some of the place names, most obviously Gipsy Hill in Upper Norwood, while South Norwood Hill was once known as Beggars Hill. The biggest Romany encampment near London was in Norwood, the ‘Great North Wood’ recorded since 1272, which stretched from Selhurst to Deptford. The most famous ‘Norwood gypsy’ was Margaret Finch, known as ‘the Queen of the Gypsies’, who had a cottage on Gipsy Hill which survived until at least 1808 when a print of it was made. Margaret is reputed to have been born in Sutton and to have spent her early life wandering throughout Britain. 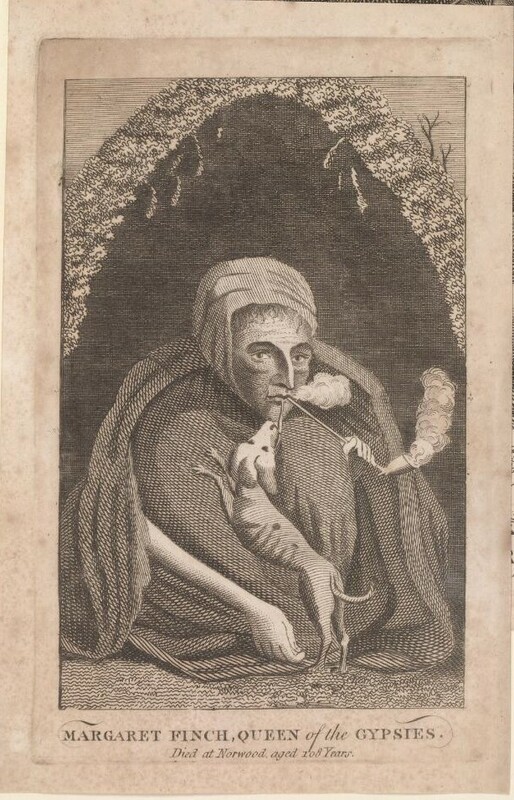 Sometime around the end of the 17th and beginning of the 18th century she came to settle in Norwood and her fame as a teller of fortunes soon spread. It was very fashionable throughout the 17th and well into the 18th centuries to consult Romany fortune tellers. Pepys writes in his diaries of having been with his wife to have their fortunes told. Margaret Finch would sit under the lych gate of Beckenham Parish Church and it was here that she met her customers. She adopted a crouched stance, her chin resting on her knees, and it is recorded that when she died in 1740 aged 109, her limbs could not be moved after so many years sitting in the same position and so it was necessary to bury her in ‘a deep square box’. An account of her funeral in a history by James Caulfield says: The singularity of her figure, and the fame of her fortune-telling, drew vast concourse of persons from the highest rank and quality to that of the lowest class in life. Norwood, and the roads leading to it, on a fine Sunday, resembled the scene of a fair; and, with the greatest difficulty only, could a seat or a mug of beer be obtained, at the place generally called the Gipsy-house. Margaret was buried in Beckenham Parish Church graveyard. Margaret’s niece, Old Bridget, succeeded her as Queen of the Gypsies. Bridget died in 1768 and was buried in the old graveyard at Dulwich. 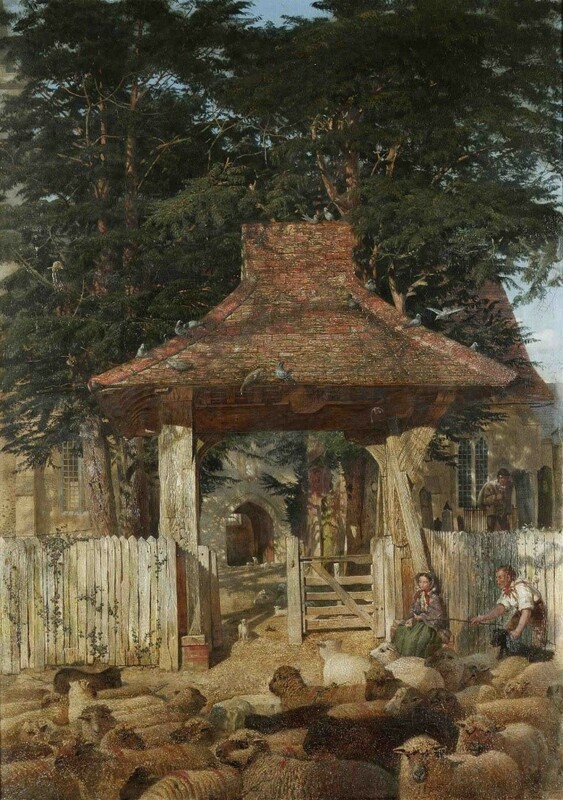 This 1851 painting by John McCullum of the lych gate at St George’s Church is supposed to depict a romanticised image of the youthful Margaret Finch.